One may have noticed one thing among all the stereotypical hippie characters in movies that they all are lean and skinny. This stereotyping usually originates from the most common observations of Cannabis consumer being lean when compared to non-consumers. Even though one has the uncontrollable hunger for food after smoking weed, there are researches stating that Cannabis helps reducing weight, a major benefit, apart from being used in treating various medical conditions. 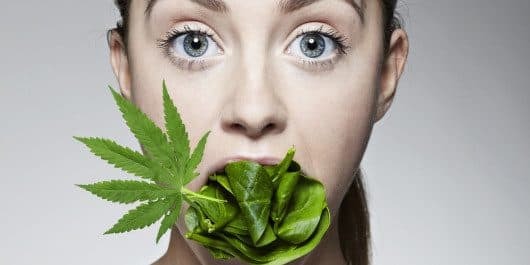 Weed and Weight: Every Cannabis consumer has experienced a sudden urge to eat after consuming marijuana and this causes ’munchies’, a term used to define this snacking behaviour. But even after having munchies, the consumers still manage to be slim with a smaller waistline. According to researches, Cannabis consumers have lower BMI i.e., Body Mass Index and slimmer waistlines while the consumers eat about 600 calories more per day on an average when compared to the non-consumers. The consumers are also considered to be more active with a lower risk for type 2 Diabetes and 16 percent lower fasting insulin levels. But how is it possible? Surprisingly, many researches have stated that the therapies from the chemical compounds of Weed can help in aid of Diabetes. In 2013, a british research published in Nutrition and Diabetes found that certain chemical properties of marijuana helps in having better blood sugar control. They tested their theory on rats and found that tetrahydrocannabivarin (THCV), a lesser known cannabinoid helps in improving insulin sensitivity in rats.In 2012, GW Pharmaceuticals, a British company announced a few successful findings in a 62 person human trial. According to their trial, the chemical compounds of Cannabis exhibited plenty of benefits along with better plasma and insulin glucose levels. Few British Scientists in 2012 had published a research stating that few chemical compounds in Cannabis can have a suppressing effect on appetite. Another research in 2015 published in PLoS can explain things in detail. A rodent research was conducted and was discovered that THC i.e., tetrahydrocannabinol treatment helped the rodents in slowing down the weight gaining and fat gaining process, while controlling the energy intakes as well, in obese mice. The researchers induced these rodents daily with THC for 3 weeks with an increased dose in the fourth week.While it helping the obese mice in losing weight, it did not cause any weight loss in the lean ones. There are strains that don’t have a tranquil and dazed effect on your body. These right strains can help one to stay attentive and focused. These benefits are subjective but the high can definitely take you in a zone and makes you stay there for a while. THCV is not the only compound that encourages weight loss in your body after consumption. Some researches have shown that CBD i.e., cannabidiol which is not responsible for the high, can affect the appetite as well. The CBD can lower your appetite. Obviously, just smoking cannabis is not going to help you lose weight. It can act as a supporter or contributor to the process of weight loss but not the only reason. Your weight loss depends upon stress reduction, a balanced diet, physical exercise, pleasurable social activities and adequate sleep along with the consumption of cannabis. This acts as the ideal plan to lose and manage weight.